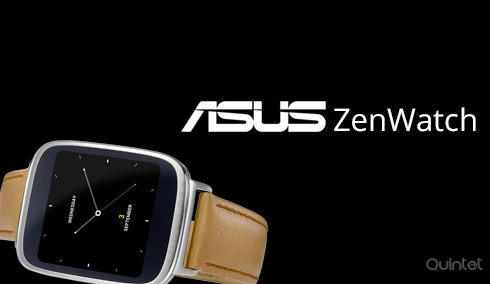 ASUS ZenWatch is the first wearable crafted by ASUS. They are competing against the big manufactures such as LG , Samsung and Motorola. ASUS boasts about its superior craftsmanship and features. The stainless steel case and curved display glass makes this watch attractive and classy. It is packed with the “smart” functionality . ASUS ZenWatch is compatible with any Android smartphone running on 4.3 or higher versions of Android. With ASUS’s smartphone app, the watch will be able to integrate with ZenUI apps. The device enables the user to get reminders from to do lists, view incoming calls, notifications , messages and much more. With the calendar you will be able to see which event comes next in schedule right on your wrist, without searching for your phone. The ASUS has a clever feature called Remote Camera that lets you see your Android phones Camera viewfinder on you ZenWatch. This comes in handy while taking those odd shots that you may face at times when you are trying to take a family photo with yourself in it. You can easily configure the watch face using the ASUS ZenWatch Manager App . The trend among watches these days is the fitness monitor app. ZenWatch has its on “Wellness manager’ app which measures your relaxation levels using a “bio sensor” which is inbuilt into the watch. It also shows the calories burned, steps taken, heart rate and the intensity of a workout. There will be millions of people who want to get hold of such android watch apps which open gateways for developers and companies who want to make their own fitness app. ZenWatch will also be affordable attracting huge audience. Quintet Solutions offers offshore developers for ASUS ZenWatch. Smart watches are a fashion statement these days and when we develop beautiful and useful apps it becomes even better. ASUS ZenWatch watch is android driven itself, but tuned to suit watch wearers. ASUS ZenWatch watch gathers all your information which can be used for authentication, identification and security. Instantly receive messages from your friends, appointment notifications, and weather updates at just a swipe of your finger on the watch. You’ll get notifications from all your existing Android apps on your ASUS ZenWatch watch by connecting your phone to your wrist. ASUS ZenWatch is going to be a big manufacturer of watches for health and fitness enthusiasts. Our Android Wear developers are developing ASUS ZenWatch apps using Android Wear SDK. Our Designs are very popular for their user interfaces, user integration and friendly user navigation. There are lot of points to kept in mind while designing apps for wearable devices as it is different from designing for phones and tablets. The scope of integrating day to day activities is much more in wearable apps. Watch faces are designed with utmost care as devices differ in their dimensions. Our designers have already started researching into the various aspects of the design to make sure we are upto date with the latest design trends. Please do not hesitate to contact us for creating the perfect app which can exploit all the possibilities of smart wear devices.